Norton presented at the last EICMA in Milan two handmade and designed superbikes in the United Kingdom: the new Norton V4 SS and Norton V4 RR, the most technologically advanced British road motorcycles that have ever been produced and which come onto the market in two versions: the limited edition Norton V4 SS that will be available for only 200 customers, in addition to the exclusive Norton V4 RR. Since Norton released these models at the end of 2016, the reserves of the Norton V4 SS sold out in a matter of days, a success that the British brand hopes to repeat with the V4 RR, currently limited to 250 units worldwide and whose order can already be done through its official website. 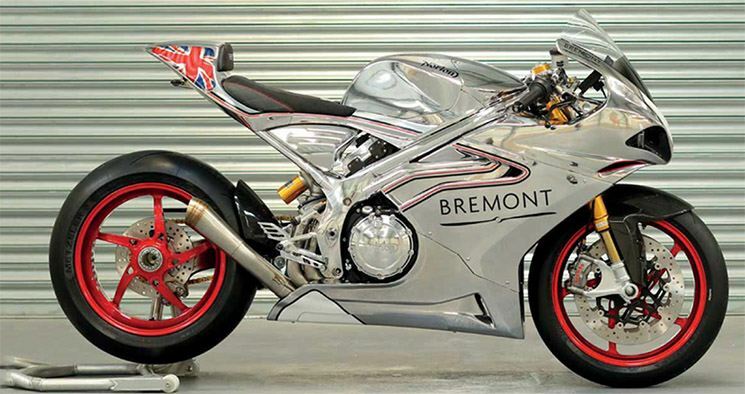 Built by hand and designed at the East Midlands factory, the design team was inspired by Norton’s 118-year history of building motorcycles, combined with the excellent British engineering and design techniques used by British supercar manufacturers. The heart of the revolutionary new Norton is a new V-shaped, 72-degree 1,200 cc engine designed in collaboration with engine technology specialist Ricardo, which records 200 hp at 12,500 rpm. The engine block was developed at the same time as the entire design of the bike to complement Norton’s design goals that included: timeless design, use of special materials, hand-made parts and staying true to the authentic heritage of Norton. The V4 engine uses titanium valves, a 6-speed cassette-type gearbox, and an anti-rebound clutch developed competition to make it easier to drive sports and quick gear reductions with the autoblipper system. The eight injectors employ variable lengths of intake and a complete accelerator system ride-by-wire. It makes 130 Nm of torque at 10,000 rpm. And, of course, the new engine is compatible with Euro 4 still delivering 200 HP of power. The new Norton V4 RR employs a two-part split radiator with an additional oil cooler. This allowed the team to place the electric fan in the lower part of the radiator and move the motor forward to obtain an optimal weight distribution. Norton offers, as an option, a race exhaust system made of titanium that saves 8 kilos of weight compared to the series system, adding 10 extra cv of power. This escape cannot be used on public roads. “The V4 has launch control, anti-wheelie, gear reductions with autoblipper, rapid gait increases, traction control, fly-by-wire accelerator, cruise control and everything works through a 7-inch color screen. 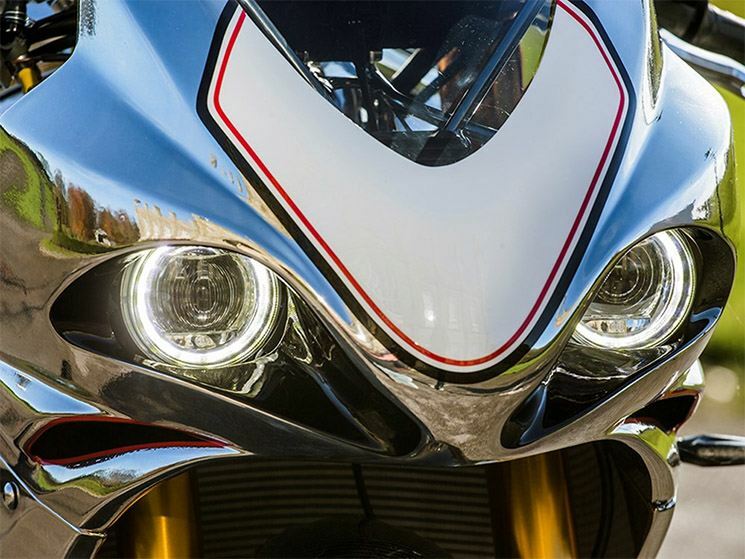 We do not think we need an infinite level of traction control adjustments, it’s not about that, we have a couple of configurations, or the rider can disconnect it and have fun, that’s what it’s about, “Norton points out. Full-LED lights are used front and rear, and for better accessibility of the pilot, the board is a 7-inch HD color screen. All driving modes and electronics are controlled through this onboard system. 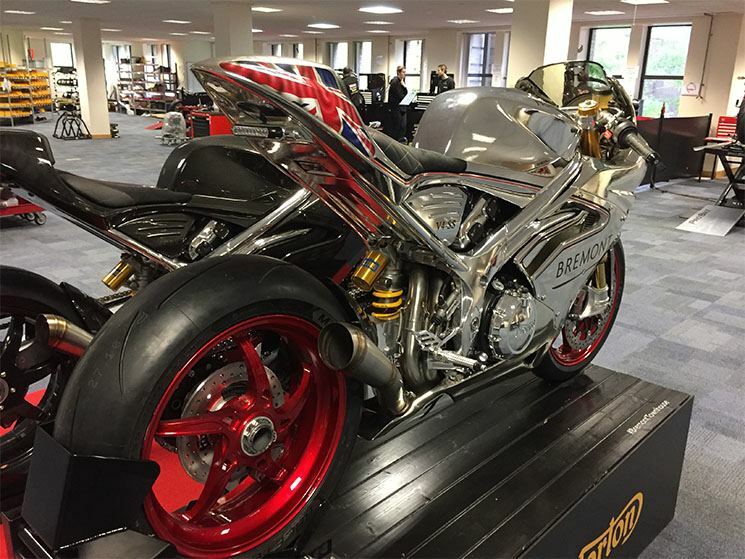 As for the chassis, we have a frame of a double tube in polished aluminum and manufactured by hand in the Norton V4 SS, and a frame and cast swingarm in the Norton V4 RR, using the geometry and rigidity tested in the TT with Norton racing motorcycle SG5. In the case of the V4 SS, the largest pipe sections of the main frame are CNC machined from aerospace quality blocks. The frame is 3 kg lighter than that of the SG5 racing bike. In the Norton V4 SS, the stabilizers are machined from aerospace-grade 7020 aluminum blocks, combined with extruded blocks of the 7000 series specially developed for motorcycle frames according to aerospace quality standards. The frame is welded by hand in the Norton factory and also polished by hand with a mirror finish. The Norton V4 RR will have a cast iron swingarm and also cast iron stabilizers. The dry weight of the whole set is 179 kilos in the case of the SS. 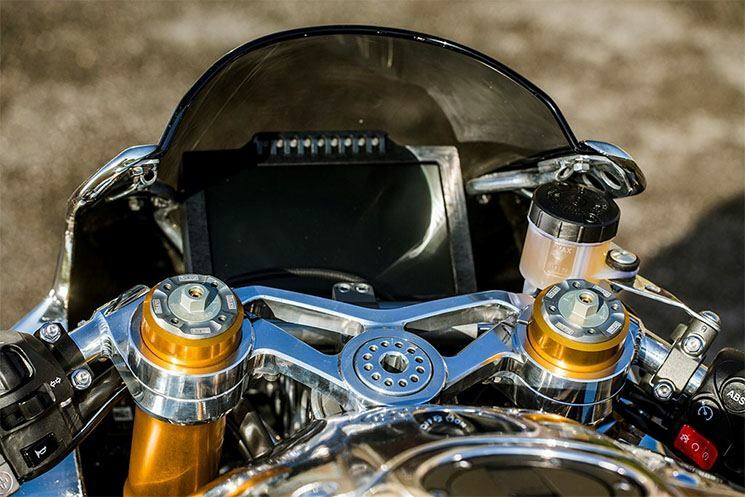 The Norton V4 SS has a CNC-machined single-arm swingarm for extreme rigidity and lowering the center of gravity. A block of 70 kg is machined to get a swingarm that weighs only 3.1 kg. Depending on the color requested, the wheels are completely carbon fiber on the front and rear on the black carbon fiber bike. The chrome motorcycle will use forged aluminum wheels in red as they are used in the TT SG5 motorcycle. The narrowness in the frontal profile is due to the ingenious packaging of the engine. An 18-liter fuel tank with a MotoGP-type seat is completely made of carbon fiber, with Kevlar reinforcement and chemically coated on the inside to meet fuel resistance standards. The air filter box is formed with part of the lower base of the tank. The Norton V4 offers a fully adjustable Öhlins NIX 30 fork system with Brembo Monobloc radial calipers on large, fully floating 330mm front discs. In the rear train, the Norton V4 uses a rear shock absorber Öhlins TTX GP specially designed for the Norton V4 SS in collaboration with the legendary suspension firm. A Öhlins steering damper is also fitted as standard. 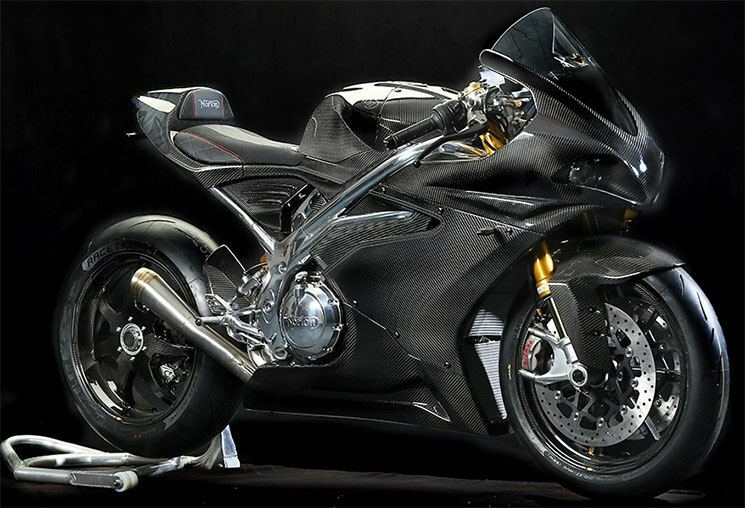 Using the carbon fiber bodywork, the V4RR and the SS are available in both carbon fiber and TT replica chrome finish, such as the Norton SG5 racing bike. Prices start at 32,000 euros for the RR and 51,000 euros for the exclusive V4 SS equipped with BST carbon fiber wheels and a fully polished chassis with more than 26 hours of work. Type: Norton V4 72 degree, liquid cooling, 1,200 cc, chain driven camshafts with an intermediate pinion to reduce engine height. Titanium intake valves. Anti-rebound clutch. Fuel injection: Electronic fuel injection system. Admission sections constantly variable. 8 fuel injectors. Complete “drive-by-wire” independent system for the front and rear cylinder blocks for exceptional control and sensations. INSTRUMENTATION: 7-inch full-color screen with multiple functions. Motor mode setting that includes: Road, Track, and Pro-Race. Driving modes include a rearview camera. QUICKSHIFT: The Complete system of quick change with reductions by autoblipper. Embedded DATALOGGER: Complete data storage capacity that includes: lap times, the maximum angle of inclination, maximum speed, maximum acceleration and maximum braking force. TYPE: Double tube frame in polished aluminum. ADJUSTABLE GEOMETRY: The frame is fully adjustable, including the swingarm axis and the launch angle. Angle launching the address of 23.9 degrees preset as standard. MACHINING MONOBRAZO TILT: 570 mm long. Reinforced and suspended design developed in conjunction with the SG5 TT racing bike. Machined from a 7020 aluminum block. REAR SUSPENSION: Öhlins tail shock TTXGP custom made for Norton fully adjustable. BODYWORK AND STYLE: Full body in carbon fiber. Available in bare carbon fiber or chrome finish with Union Jack air polish on the tail.